Sterling silver, real Tiger Eye, and 12KGF. 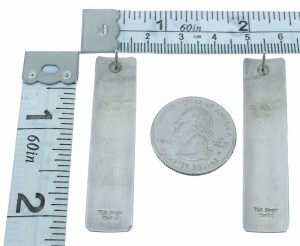 Post earrings measure approximately 2-1/8" long and 1/2" at widest point. Expect plenty of compliments while wearing this stunning pair of earrings! 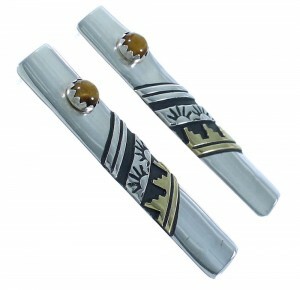 This piece of Native American jewelry is Navajo overlay hand crafted by artist Thomas (Tommy) and Rose Singer, out of genuine sterling silver, real Tiger Eye stones, and 12 Karat Gold Filled. Overlay is a process that utilizes at least two layers of sterling silver or 12KGF. One layer forms the foundation, while the second layer is used to design the individual detailed overlay. 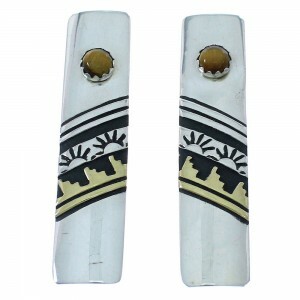 This pair of earrings has a total of TWO stones (ONE in each earring) that are delicately placed in hand cut bezel settings, while the second layer forms lovely 12KGF border patterns and stamped designs for a lovely finish. The pair of earrings are stamped sterling and hallmarked by the artist.